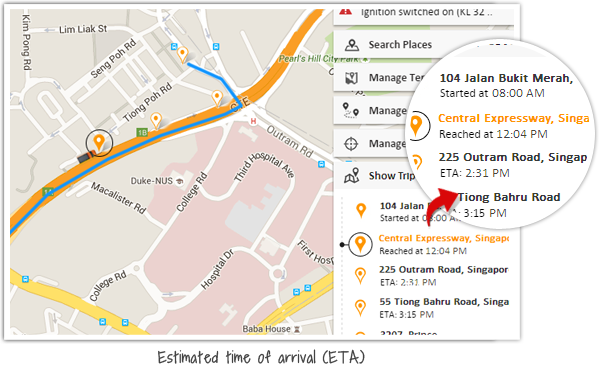 With the latest version of AVLView, you may create instant daily trips for your vehicles on map, include all the client locations en-route and get estimated time of arrival at destination/final point; so you know the approximate time vehicles take to reach your client locations. To offer you the most possible accurate information, ETA is re-calculated at each waypoint en-route. Step 1. Click on the tab ‘Schedule’. Step 2. 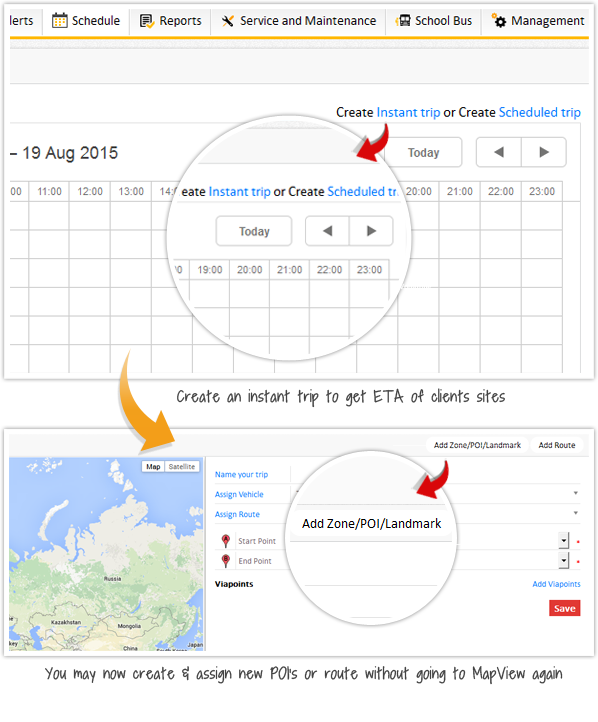 Click on Create Instant trip/Create Scheduled trip. Step 3. Click Add Zone/POI/Landmark or Add Route as required. Step 4. Zoom into the map, click on the desired location, name it and save as a POI. Note: For creating a route with waypoints included, click on each of your landmark one by one to form a route between start & end points with all the waypoints included. This new feature gives you expanded visibility to see into your fleet operations by learning how your onsite trailers are used or are sitting idle. It helps you to eliminate dependency by analysing usage and reduce the number of trailers to balance the workload. In addition, you will get notification as soon as a trailer gets attached to a prime mover. 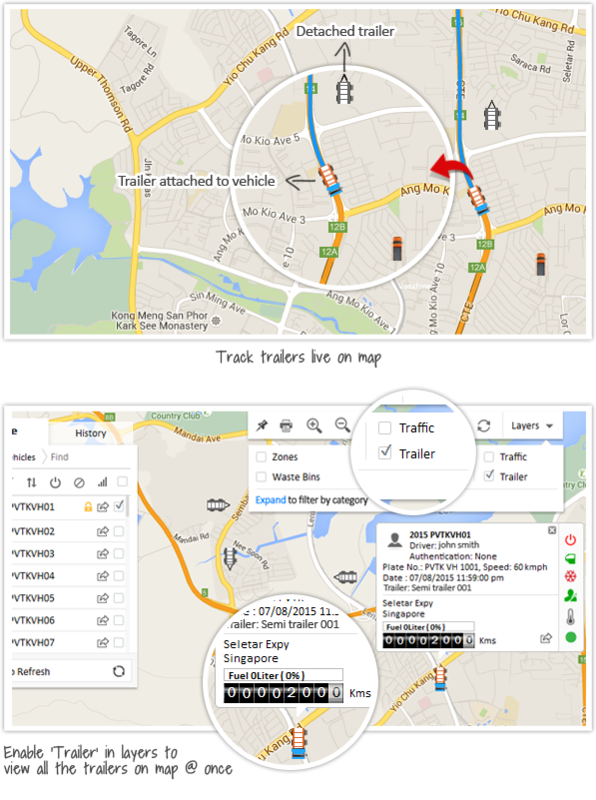 Trailers attached to a vehicle will be shown on MapView along with the vehicle. In case of trailer attachment/detachment, different markers would be shown for a clear understanding on the event. You can even locate all the trailers on map by once, all you need to do is enable ‘Trailers’ in Layers. Authorization for trailer operations can be made mandatory using iButton devices. ‘Traffic’ layer added to MapView. POI visit report with an overview on the stoppages made by your vehicles/drivers at each POI/Zone you created on map. Dashboard got optimized letting you view the whole list of vehicles on scroll down the page. Refuel & drain data made available with canbus connectivity.